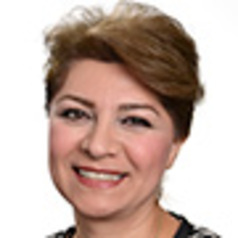 Farideh was offered a Senior Lectureship in Pharmacology at the University of Huddersfield in June 2008. Following her first degree in Chemistry with First Class Honors at the University of Tehran, she then completed an MSc programme in Pharmacology with Distinction at the School of Pharmacy in the University of Bradford. In 1996 she started a PhD research project at the same school in the University of Bradford. Her PhD project was on the neuropharmacological investigation of drugs- and motion-induced emesis and changes in the gastrointestinal motility. Following completion of her PhD studies in 1999, she was employed in various posts at the University of Bradford, including Research Fellow and then Lecturer. During this time she successfully supervised various PhD programmes and also became a Fellow of the Higher Education Academy prior to her move to Huddersfield. She holds several patents as a result of her collaboration with industry. She developed the Pharmacology modules for the MPharm course at the University of Huddersfield for years 1, 2 and 3 and her on-going research programmes focus on identifying and investigating the mechanism of actions of novel drugs in cancer Pharmacology. Her ultimate aim is to develop novel drugs for cancer patients. My research interests focus on how disease processes or abnormalities modify the function of the gastrointestinal tract and also the mechanisms of actions of drugs affecting this system. There is a special interest in establishing the precise involvement and interaction between central and peripheral serotonergic, cannabinoids, neurokinin and other peptidergic systems relevant to significant therapeutic advances in gastrointestinal disorders such as irritable bowel syndrome (IBS) and/or inflammatory bowel disease (IBD). I have also been involved in a research collaboration with the GW Pharmaceuticals to investigate the anti-cancer effects of non-psychoactive cannabinoids on a variety of tumour cells. Further research are under way to also investigate the anti-inflammatory actions of phytocannabinoids and other herbal medicine.